Showing results for tags 'flutterbat'. The apples. Give them to me. And she's not saying please. 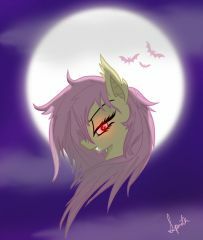 Flutterbat is back for the scariest night of the year! And she's got a mighty appetite for apples! 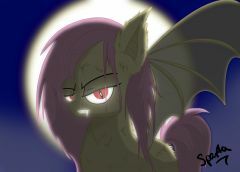 She's part one of the 2 part Batponies Ive got ready for NightMare night! And guess who else has an insane craving for sweet yummy apples? Let's just you can multiply that craving by 20%! Happy NightMare night! © Hasbro owns Fluttershy, art is mine. I took a break from my commissions to whip this up. It took longer than expected though, the hair took like an hour to get to where I was satisfied with it. 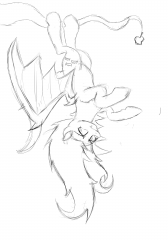 I was still kinda lazy, hence only the head. xD However, I simply love it and I am planning on drawing a proper full body shot.